Festival’s charities partners include Bert’s Big Adventure, Share Our Strength’s Cooking Matters program and more! 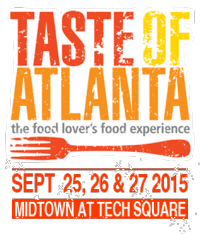 ATLANTA (August 27, 2015) – This year’s Taste of Atlanta is set to serve up phenomenal fun and food that is not only tasty on the tongue, but also good for the soul. The festival, returning to Midtown at Tech Square Friday, September 25 – Sunday, September 27, has once again partnered with several nonprofits to benefit local charities and to provide support for Atlanta families in need. New this year, Taste of Atlanta has partnered with Bert’s Big Adventure, an organization that provides a magical, all-expenses-paid, five-day journey to Walt Disney World® for children with chronic and terminal illnesses and their families, and The Giving Kitchen, an organization that provides emergency assistance grants to Atlanta area workers facing unanticipated hardship. Over the past 13 years, the festival has donated portions of event ticket sales and silent auction proceeds to a variety of area nonprofits and provided several tons of leftover food to the Atlanta Community Food Bank. This year, Taste of Atlanta will donate a portion of the event proceeds to Bert's Big Adventure, and all silent auction proceeds will benefit Share Our Strength’s Cooking Matters Atlanta project, a cooking-based program that provides a strong foundation in nutrition, cooking, and household budgeting through specialized courses for adults, kids, and teens. A portion of the proceeds from Taste of Atlanta’s kickoff event, themedBucket List Bash, on Friday, September 25 will be donated to The Giving Kitchen. This all-inclusive block party will feature bites from some of the city’s best restaurants, delicious drinks crafted by unmatched mixologists and lively tunes from Five Bone Rack and Blair Crimmins & the Hookers. Taste of Atlanta also supports American Culinary Federation (Greater Atlanta Chapter), Second Helpings Atlanta, Inc. and Hospitality Education Foundation of Georgia’s ProStart® program. “It’s a privilege to be aligned with such powerful charities,” said DeSena. “Their dedication to supporting our community and raising awareness and financial aid for families in need is truly inspiring. I welcome any opportunity for Taste of Atlanta to play a role in helping these organizations reach their goals and ultimately making a difference." For more information about Taste of Atlanta’s charity partners or to purchase tickets, please visit tasteofatlanta.com. Taste of Atlanta packs the bold flavors, colorful personalities and vibrant energy of an entire city into 10 blocks in Midtown Atlanta to turn tasters into diners. The three-day festival explores the city's unique neighborhoods by sampling tastes from the chefs and bartenders that give each area its own creative energy. Since its inception in 2002, Taste of Atlanta has become an annual pilgrimage for thousands of food, wine, beer and cocktail lovers from across the country. Festival attendees bring their adventurous appetites and experience a full range of flavors, from time-honored Southern classics to innovative dishes that are destined to be the next culinary trend. Patrons also enjoy interactive cooking demonstrations on four main stages, live entertainment and family-friendly activities for food lovers of all ages. Taste of Atlanta supports several Atlanta non-profit groups, including Share Our Strength’s Cooking Matters, Atlanta’s Table, Georgia Organics and Hospitality Education Foundation of Georgia and ProStart®. Indulge in the city’s flavors Friday through Sunday, September 25-27 in Midtown at Tech Square to truly savor what makes Atlanta the food capital of the South. For more information, visitwww.tasteofatlanta.com. TasteATL, the culinary event management company best known for orchestrating Taste of Atlanta, the city’s largest food festival, presents food festivals and events throughout the year. For more information, visitwww.TasteATL.net. Established in 2002, Bert’s Big Adventure is a 501(c)(3) nonprofit organization that provides a magical, all-expenses-paid, five-day journey to Walt Disney World® for children with chronic and terminal illnesses and their families. To qualify for Bert’s Big Adventure, children must be between the ages of 5 and 12, live in “The Bert Show” radio listening area, prove financial need and have never been to Walt Disney World®. Following the annual trip, Bert’s Big Adventure provides year-round support through initiatives such as the Reunion Adventures, the Fairy Godparent volunteer program and additional charitable services. The trip and programs create a community of families that establish lasting friendships with others facing similar challenges. Online atwww.bertsbigadventure.org, facebook.com/bertsbigadventure andtwitter.com/bertsbigadv. The Giving Kitchen (TGK) is a nonprofit charity based in Atlanta, GA inspired by an overwhelming expression of support from the hospitality industry when Atlanta chef Ryan Hidinger was diagnosed with last stage cancer in December 2012. From helping with the cost of living expenses to funeral arrangements, TGK provides emergency assistance to members of the metro Atlanta restaurant community. Funding for the sustainability of TGK comes from a variety of sources including direct beneficiary events, personal donations and profits from a one-of-a-kind platform generated by Staplehouse Restaurant. For more information on The Giving Kitchen and Staplehouse Restaurant, visit www.thegivingkitchen.org or www.staplehouse.com.